This piece was made during 2012’s TEDxAthens. The likeness of the man on the right ranks high as one of the most recognisable in human history. For many years I thought it was Heisenberg – not Walter White’s alter ego, but the actual 20th century physicist who was his namesake. Heisenberg and the world of quantum mechanics he helped introduce to the world in the ’20s flew in the face of Einstein’s Theories of Relativity and still troubles physicists and defies common sense today. 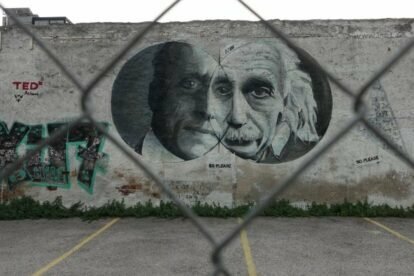 It just seemed so right that a work of street art would portray Heisenberg & Einstein together like that, showing that both theories have to be compatible by necessity – a tribute to the incompleteness of human knowledge, the interconnectedness, indeed, the relativity, of all things. Alas, I was disappointed when I discovered that the guy on the left is Constantin Carathéodory, most famous in Greece for assisting Einstein with mathematics. This piece is on Iera Odos, the Holy Road that traditionally connected Elefsina (Eleusis) and Athens for the Panathenaea, back when people did believe the Gods threw dice.